Should Warren Buffett Exit Wells Fargo? Over the course of his highly successful investing career, Warren Buffett has stood by his favourite stocks - Coca Cola, American Express, and Wells Fargo in particular. But now one of these companies has been rocked by scandal. Yes, Wells Fargo has been grabbing headlines for all the wrong reasons lately. The allegation? Employees of the beleaguered bank opened 1.5 million fraudulent and unauthorised accounts for the purposes of boosting cross selling ratios. Obviously, the bank will be heavily penalised and fined. Even if this doesn't greatly impact its financials, the damage to its reputation will be great. Given Buffett's staunch support for the bank, the spotlight has now turned to him. But let's keep the fraud allegations aside for a moment. What is about this bank that Buffett likes so much? We all know that Buffett is a big fan of companies with strong competitive advantages. And Wells Fargo has enjoyed not just one but two moats. The first is its low-cost competitive advantage. In a commoditised industry such as banking, it pays to stay lean and keep costs under control. Wells Fargo has managed to do just that. The other moat is 'switching costs'. Most people don't change bank accounts every time some other bank offers higher interest rates. This is because of the hassle and cost of opening and closing accounts, particularly when most mega banks are perceived as more or less the same. Wells Fargo serves one in three US households. This level of convenience and brand recognition help explain why Wells Fargo has enjoyed such strong deposit growth. But there's more. The bank was lauded for its resilience relative to Citigroup and JP Morgan Chase during the 2008 global financial crisis. Indeed, Wells Fargo has built a reputation as a safe place to keep money and as an upholder of ethical and prudent policies. Little wonder the stock has been one of Buffett's favourites. But with the eruption of the scandal, the bank's reputation is bound to be tarnished. We continue to make more money when snoring than when active. ... [Y]ou simply want to acquire, at a sensible price, a business with excellent economics and able, honest management. Thereafter, you need only monitor whether these qualities are being preserved. This gives us an idea of when Buffett will choose to exit a stock: When he finds that the reasons he bought the stock in the first place no longer hold true. Now, truly great businesses have strong competitive advantages, sound business models, and a good management. As long as these remain in place, Buffett sees no reason he should sell them. The bank may still have its competitive advantages, but its corporate governance standards have now come into question and the integrity of the management has been compromised. This may be enough for Buffett to seriously consider exiting his position in Wells Fargo. ICICI Prudential Life Insurance, one of the most awaited and biggest initial public offering (IPO) kick-started on Monday. This is the first pure play insurance company to get listed in India. 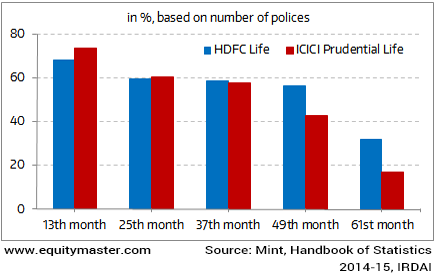 Today's chart shows the historical persistency ratio of the two leading life insurance companies. Persistency levels measure the percentage of customers who continue with their policies after a given period of time. In simple words, the persistency ratio tells you how many policies sold in the past are still alive and funded by the policyholders today. Simply put, persistency ratio = No. of Clients Paying the Premium / Net Active Clients * 100. This number is an important metric in insurance parlance, as life insurance is a long-term contract. In the initial years, the premium collected goes towards meeting costs. It is the subsequent premiums that start contributing to the margins. Given its importance, insurance companies constantly look for ways to increase this ratio. A high persistency rate is indicative of satisfied customer and effective sales practice. Think of 2008-2009. Warning letters and import alerts were things that the Indian pharma companies had rarely seen until this time. Then came the news of US FDA's crackdown on Ranbaxy's Poanta Sahib and Dewas facilities. Since then, things started changing rapidly for the once safe and 'defensive' sector. Regulatory challenges were no longer a one off risk for Indian pharma. Even the best and biggest pharma companies had to constantly be on the alert to avert the wrath of US FDA. Major stocks that touched their lifetime highs in 2015 outperforming broader markets, fizzled out in 2016. The BSE Healthcare index slipped over 5% in the last one year led by losses in big names such as Wockhardt, Dr Reddy's, Lupin, Sun Pharma, Glenmark Pharma and others. But the cloud of uncertainty will not last forever. Especially for the ones that are well equipped to deal with regulatory requirements. Over and above, those companies that have been constantly investing towards R&D and building robust pipelines will be the winners. Thus, pharma companies that are upgrading and keeping facilities compliant, and have niche product pipelines in place will see sustained revenue growth. The India Letter team has unearthed one such stock, which has developed a niche pipeline. Check out this month's issue of The India Letter, released today. In the meanwhile, after opening the day marginally higher, the Indian stock markets added to their early gains. Sectoral indices are trading on a positive note with stocks from the telecom and consumer durables sectors leading the gains. At the time of writing, the BSE Sensex was trading up 139 points (up 0.5%) and the NSE Nifty was trading up 45 points (up 0.5%). The BSE Mid Cap index was trading up by 0.5%, while the BSE Small Cap index was trading up 0.8%. This edition of The 5 Minute WrapUp is authored by Radhika Pandit (Research Analyst) and Bhavita Nagrani (Research Analyst). An analysis of Maharashtra Scooters which holds investments in Bajaj Group of Companies. Equitymaster requests your view! Post a comment on "Should Warren Buffett Exit Wells Fargo?". Click here! Equitymaster has financial interest in Bajaj Auto.